For jobs that require the strength of metal but the flexibility of rubber, a rubber to metal bonding solution is called for. 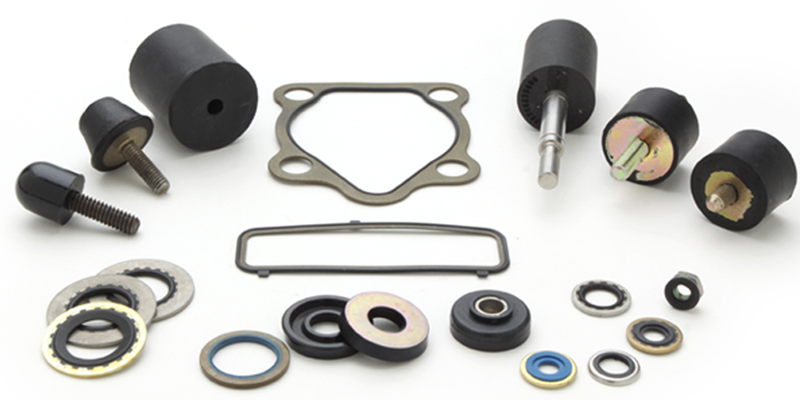 These types of components are often used in things like valve assembly, shafts and rollers, with parts available in a wide range of shapes and sizes. The process of rubber to metal bonding is not as straightforward as you might think. In order to create a high performance bond that is designed to stand the test of time, we need to mechanically bond the rubber element to the metal insert during the molding process. By combining all the components into one part, the end result is technically superior and more consistent than it would be if two or three separate components were used. Not only that, but in many cases, it may be the most cost effective solution. Before we can use any rubber to metal bonding adhesives, the surface must be prepared to ensure optimal bond performance. Any oils are stripped from the metal either via solvent degreasing or using an alkaline cleaning process. If there is any sign of rust, this needs to be thoroughly removed too. Once the component has been prepared, we keep it in a clean, low humidity environment to prevent further contamination. Any handling of the component is undertaken with gloved hands, to prevent the natural oils on skin from coming into contact with the metal. Next, we use a heat activated adhesive to provide the rubber to metal bonding. This is applied using a spray application. Once this is complete, the metal is ready for production. The insert in placed into the cavity of the mould, and from there the normal rubber moulding process can begin. The heat from the moulding process activates the adhesives on the metal, bonding the insert to the rubber around it. Every rubber to metal bonding job we complete undergoes a rigorous quality control and testing phase, ensuring every single part is produced to the very highest of standards. NES are one of only a few rubber to metal bonding companies in the UK. Our decades of experience in this field make us a trusted supplier for this type of service and we are proud to be selected as the partner of choice for quality critical companies in the Semiconductor industry. To find out more about our rubber to metal bonding services, or to discuss any of the products on our website, please do get in touch with our friendly team today. Each of our companies takes a unique approach to transforming raw materials into specialised components for larger OEM assemblies.